The City of Traverse City has repaired a retaining wall in Parking Lot K, which adjoins the Boardman River at the Union Street Bridge (across from the Post Office downtown). As part of this project, the City has resurfaced the parking lot with four different types of pervious pavement. 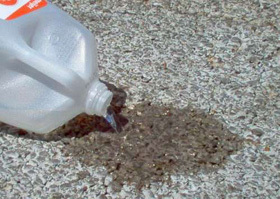 Pervious pavement systems allow stormwater to be absorbed through the pavement, rather than running off into drains. This reduces loads on the storm drain system and as the water is absorbed and travels through the soil, many of the pollutants are removed naturally. This demonstration project allows city engineers to determine what types of pervious pavement products work best and can effectively withstand Northern Michigan’s winters.